Isn't it boring if we charge our multimedia devices the usual way? Why can't we change the method? 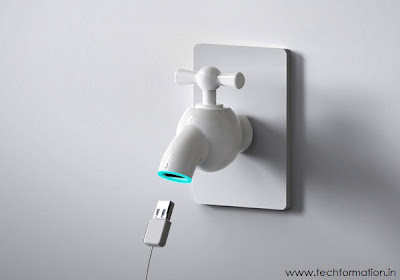 This very same idea got to one designer who conceptualized a design named 'The charging tap'. All it does is charging your multimedia devices like MP3 players, mobile phones and etc via USB cable.All you have to do is to fix the device to the wall and turn on the tap to get charged! !